Happy hour in Sedona. Created as a celebration of love, life and family for the Morrissey family. A 75th birthday present for Archie McLaren who was captured in his beloved wine cellar. 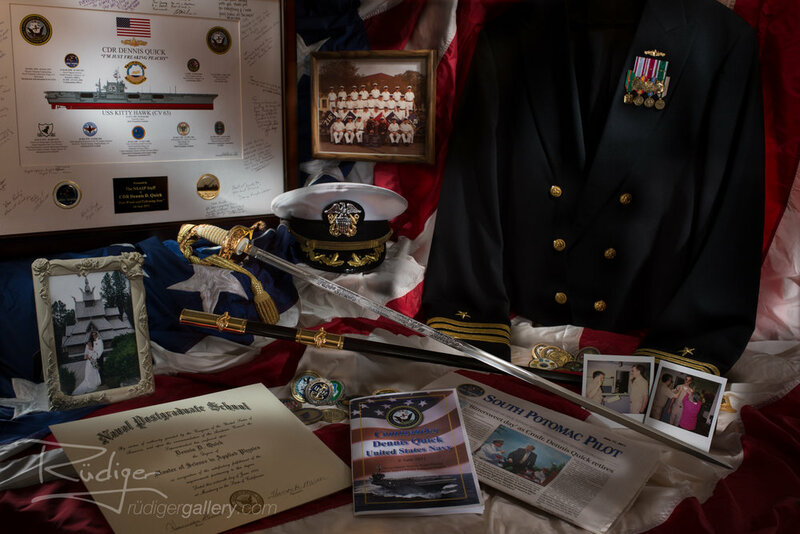 Created as a celebration of Dennis Quick’s 29 years of service in the United States Navy. The tableau was built using memorabilia from Commander Quick’s career. A colorful summer cornucopia to celebrate the 2017 Pacific Wine & Food Classic. This commission was produced as an 80th birthday gift for Larry Linson. The scene is reminiscent of his childhood home. Created for the artist himself and his lovely bride Lee Ann for the invitation to their wedding. These fine art commissions range from simple tabletop photos to elaborate personal portraits to location-fantasy images. If you would like to read how he created the image above for the Morrissey Family please read his "Life is Beautiful" blog post here. For centuries kings and queens, world leaders and business moguls have had portraits created as a lasting image of their lives. Now you can too! Rüdiger's Legacy Portraits are created using his unique "Mélange" technique that only he has mastered. Your image will be appreciated for generations and... it's the closest thing to immortality! Commemorate a life well lived, a great accomplishment, a moment in time or simply celebrate your love of family. Lets gather cherished items from your past such as photos, jewelry, medals, awards, toys and whatever else that brings brings the memories rushing back and assemble them in a beautifully lit arrangement. Rüdiger has created hundreds of these for documentaries on film and is now doing them for clients as photographs. They are fun and a great way to tell the story of lives well lived. Do you ever wish you had a great picture of that house you grew up in, that old car restored or the boat you learned to sail or your prized collection? If you look around, today’s pride and joy is tomorrow’s memory so whatever that object is that is you are so very proud of, let’s shoot it, frame it and cherish it forever.